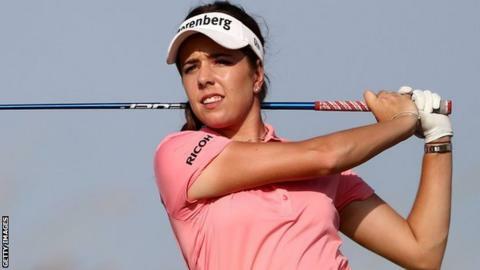 England's Georgia Hall is in a three-way tie for fifth after a third-round 74 left her five shots off the lead at the Oates Vic Open in Melbourne. Hall trails Minjee Lee by five shots. The Australian leads on seven under despite a two-over third round of 75. Lee's compatriot Karis Davidson lies second on six under at the Ladies European Tour event. The tournament, which also features a men's event, has both sexes playing for equal prize money.